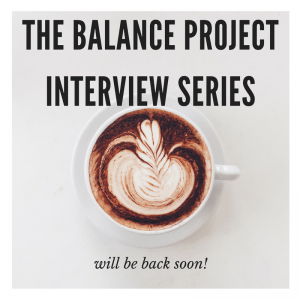 The Balance Project interview series has been on hiatus for over a year. I posted the last interview in November, 2016, but I stopped publishing regularly last May. I was ambivalent about taking the time off, but I knew it was the right decision because I wanted to focus on my writing and the other business of publishing novels. While doing The Balance Project is rewarding in many ways, it’s also quite time consuming. I wrote my third novel, THE SUBWAY GIRLS*. I signed with literary agent Carly Watters at P.S. Literary. I sold THE SUBWAY GIRLS and my as-of-yet unwritten fourth novel to St. Martin’s Press in a two-book deal. And, I started writing that fourth novel. To be honest, though, I missed doing the interviews. And, to my pleasant surprise, so did many of you. (Thank you for reaching out and telling me—that meant so much!) So, they’re coming back mid-October. I’m hard at work putting together a plan that will incorporate an interesting mix of new interviews along with some already-published favorites. If you or someone you know would be a good fit for The Balance Project interviews, please reach out via my Contact page. I’m always looking for interesting women to feature. *THE SUBWAY GIRLS will be published next summer, but the preorder button should be up on Amazon soon.